Most of us are familiar with the story of Koko, a female gorilla known for adopting a pet kitten and learning quite a few sign language hand signs. Koko lived most of her life at a California preserve run by the Gorilla Foundation, along with male gorillas Michael, who died in 2000, and Ndume, who had been moved from the Cincinnati Zoo in 1991 to be Koko's companion. Koko died in June of this year, and, as part of his loan agreement, Ndume was expected to return to Cincinnati "as soon as possible." But the Gorilla Foundation is allegedly blocking that move, and now the Cincinnati Zoo is suing for his return home. 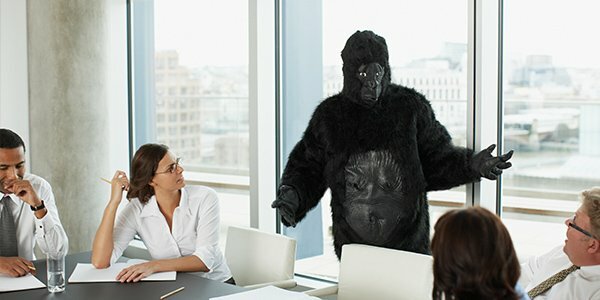 "We have ten gorillas, including relatives of his, who can provide socialization opportunities, qualified vets, dedicated, highly-experienced gorilla caregivers, and an excellent AZA-accredited facility that we recently renovated and expanded," according to Cincinnati Zoo Director Thane Maynard. Ndume has been living in isolation since Koko's death, and the Association of Zoos and Aquariums has recommended his return to Cincinnati. However, despite a loan agreement that was updated in 2015 and assured Ndume's return, Gorilla Foundation President Penny Patterson allegedly said she "did not intend to cooperate with the move" and the foundation sent a letter to its followers which said it planned to keep Ndume and acquire a female gorilla to live with him. The lawsuit also claims Gorilla Foundation officials refused to allow Cincinnati Zoo leaders to come to the facility to build a crate for transportation in Ndume's enclosure. The Gorilla Foundation claims it doesn't want to move Ndume because it's concerned about transferring an older gorilla. "Although we respect those concerns and everybody shares those welfare concerns, they're not valid," Ron Evans, Cincinnati Zoo's curator of primates told WCPO. "The foundation need for a social animal like a gorilla is to have company of other gorillas," Evans said. "That's the exact reason why we didn't remove Ndume from the Gorilla Foundation sooner because he had not been living with Koko directly for some time." Now the concern is that litigation could leave Ndume isolated for even longer.